Investors need a home inspection before buying a rental property to help protect their investment. A home inspector can be found through reference or by searching through the database provided by the American Society of Home Inspectors. Rental property owners should have quick access to a home inspection checklist at all times. 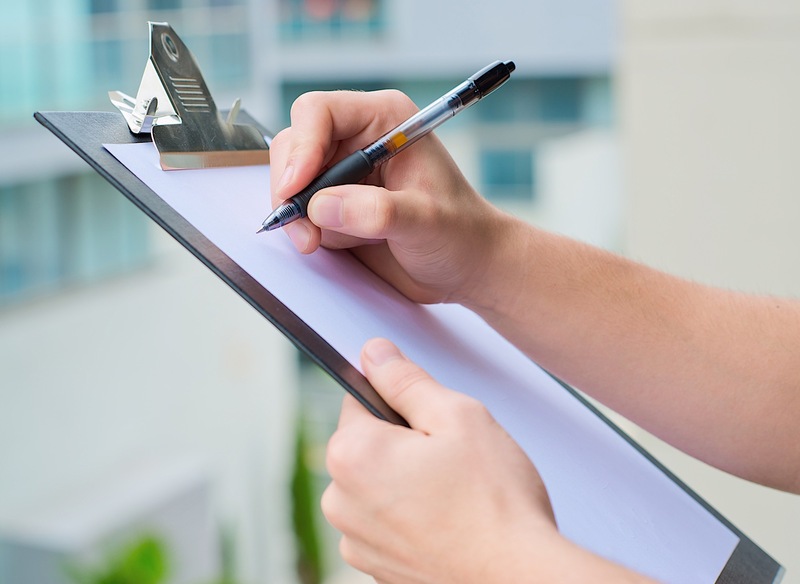 If you are a rental property owner, you may already know that a good home inspection checklist can be your best friend. Maintaining an up-to-code rental property is an important function of a landlord, both to ensure the safety and wellbeing of tenants and to protect the value of your property. Read on to gain a better understanding of a why a home inspection checklist can be so important, how to find an inspector, as well as home inspection tips and tricks. Be sure to download the printable home inspection checklist that is provided. Why Do I Need A Home Inspection Before Buying A Rental Property? Investors need a home inspection before buying a rental property, both to protect against potentially bad deals and to address problems before they start eating into profits. A home inspection is one of the only ways an investor can truly find confidence in whether or not they have come across a great rental property. The home inspection process can reveal extensive damage that is completely hidden from plain sight, which can translate into expensive repairs at a later date. Or even worse, problem areas that go undetected or unaddressed can endanger your tenants. For example, tenants can get sick due to mold exposure, after which they will have full rights to take legal action. In another example, let us suppose that the inspector discovers significant structural damage that can cost you tens of thousands of dollars. Having made use of a proper home inspection checklist gives you the opportunity to back away from a deal if repairs are too extensive to make financial sense. An inspector can also help to identify issues that can be nipped in the bud, so that they do not develop into more expensive problems down the line. Finally, the timing of arranging a home inspection before buying a property is pertinent. It is in the best interest of the seller to “dress up” the property to make it look better than the actual condition to help the property sell. Issues found during the home inspection process for buyers should go into the seller’s realm of responsibility. 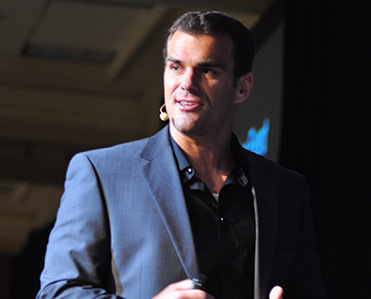 This can be leveraged as a means to ask the seller to address the issues, or to lower the purchase price. These home inspection tips can apply to first time buyers, as well as to the new home inspection process. An investor considering the purchase of a new build is still encouraged to have an inspection, as even brand new properties are not always without problems. You can find a home inspector by asking your personal networks, or by searching through reliable databases. If you happen to be working with an agent who specializes in rental properties, they may be able to give you one or more recommendations. You can also ask fellow investors in your professional networks for recommendations on property inspectors they have worked with in the past, especially those who specialize in inspecting rental properties. If you are wondering where to find a home inspector online, you have the option of searching through the “Find A Home Inspector” database provided by the American Society of Home Inspectors. Member inspectors are required to complete specific trainings and abide by a professional code of ethics, helping provide investors with confidence when selecting an inspector. Regardless of where the home inspector is found, a rental property investor should make sure to call and interview prospects. Part of the vetting process should also include reading reviews on sites like Angie’s List, Yelp or Google, as well as asking inspectors for a sample of what an inspection report might look like. During the interview, you can ask about their experience and any certifications, what will or will not be included during the inspection, and a copy of their license and proof of insurance. What Happens During The Home Inspection Process? Once you have a professional home inspector in mind, it is a good idea to start gaining an understanding of what happens during the home inspection process, and start developing a home inspection checklist of your own. Because you are paying for a service that can cost several hundred dollars, it is in your best interest to educate yourself on the process so that you know what to expect, and to prevent any oversight. First, you should plan ahead to be present at the property throughout the inspection. The inspector will explain their personal process in detail before commencing, but you can expect the process to last at least two to four hours. The timeline is influenced by the size of the property, its condition, and how many questions are asked. Investors should feel empowered to ask as many questions as they would like, but it can sometimes be a good idea to write down questions and save them for a good stopping point, so as not to distract the inspector from the task at hand. 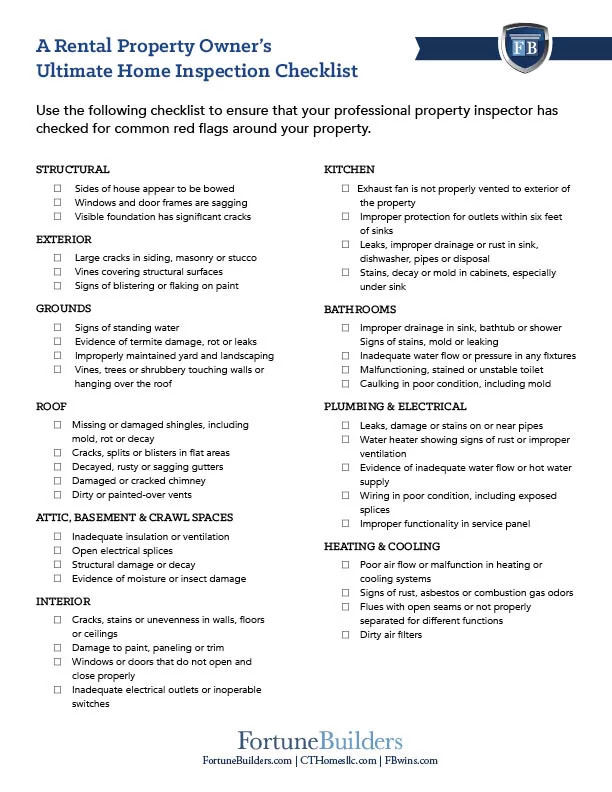 The inspector will be following their own professional home inspection checklist to comb through the property and identify potential problem areas that need to be addressed. Once the inspection is complete, they will over their findings with you. It should be noted that they will most likely not give you specific repair estimates, but they will be able to tell you if a repair will be a small or big job. They may also recommend additional specialty inspectors that they can either do themselves at a premium, or through a recommended specialist. Some inspectors will provide a written report on the spot, or will follow up with the report in an email on a following day. If you are facing a home inspection completion deadline, it would be a good idea to inquire about how long it will take to receive the report. Clean the property thoroughly: The home inspection process looks slightly different than that for buyers, and most home inspection tips and tricks will center around making sure the inspection process goes smoothly. The first step in ensuring an easy inspection for everyone involved is to cleaning the property thoroughly. Create workspace and accessibility: Next, sellers will want to clear a workspace around hard-to-access areas such as around the furnace and water heaters. In addition, make sure that the inspector will have clear path to accessing the attic, garage and crawl spaces. This may include moving any boxes away from the walls. Leave utilities connected: Finally, leave any utilities connected so that the inspector can test appliances, as well as heating and cooling systems. Pilot lights should also stay ignited, and keys for locked systems or electrical boxes should also be provided. If an inspector is unable to complete their process, they may need to reschedule and charge a re-inspection fee. Research the home inspection process: Buyers should make sure to research and educate themselves on what should be covered during a typical inspection. They may even develop their own home inspection checklist to make sure that their inspector has done a good job. Take plenty of photos: Pictures are critical for gathering evidence, and a good inspector will come equipped with camera equipment, including infrared and thermal cameras. Although you may not follow the inspector onto the roof or into crawl spaces, ask them to photograph any potential issue so that you can take a look yourself. Do not be afraid to ask questions: Although it is always a good idea to respect an inspector’s time and expertise, buyers should always feel empowered to ask questions. Paying for a property inspection is not cheap, and is an integral part of making a property-buying decision. If something does not feel right or you do not understand something, there is no reason not to ask for clarification. A home inspection checklist can be the key to protecting a rental property owner’s bottom line, whether it be preserving property value, avoiding a bad deal, or addressing issues before they become colossal problems. Although it is up to the professionals to execute the home inspection process itself, it is never a bad idea for a rental property owner to be aware of what the process should look like.